(Anaheim, Orange County) On Tuesday, June 3, 2008, 70 students, parents, educators and community leaders came together at Loara High School to learn about the college admissions process for undocumented students, and AB540, a state law that allows eligible students to pay in-state tuition at California colleges and universities. The community education forum – “Access to Equal Education” – was organized by a coalition of community-based organizations and advocacy groups dedicated to educating the diverse immigrant communities of Orange County about their access to higher education. The immigrant communities of Orange County are rapidly evolving. From 2000 to 2006, the Latino population grew 13% while the Asian American and Pacific Islander population has grown 24.6%. As the face of Orange County changes and the immigrant communities continue to grow, it is critical that community–based organizations work to educate and organize community members so that their needs are met and issues are addressed. AB540 was signed into law in October 2001 and allows eligible immigrant students to pay in-state tuition at public colleges and universities. Undocumented students are eligible for AB540 if they: have attended a California high school for at least three years; graduated from a California high school, received a high school equivalency or received a Certificate of Proficiency; and filed the AB540 nonresident tuition exemption request form. In Orange County however, students have faced difficulty in being recognized as AB540 students, with college admissions officials challenging their registration to the schools and their right to in-state tuition. 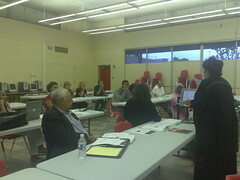 “We have hundreds of cases of eligible AB540 students being rejected admissions in Orange County. It is critical that we educate administrators about AB540 and advocate for proper implementation of the law so that students and families are not put through an unnecessary trial of hardship and stress,” said Joann Lee, Directing Attorney at the Legal Aid Foundation of Los Angeles. “As we continue to wait for Congress to enact laws that fix the immigration problem, we are seeing cities and states misinterpreting existing policies and laws. These actions feed into an anti-immigrant sentiment which expresses the opinion of only a minority of Californians,” said Eun Sook Lee, Executive Director of NAKASEC. “Korean Americans are part of the undocumented population and many are living in Orange County. Since 2000, the Korean American population of Orange Country has grown more than 43%. At the Korean Resource Center, we work to educate our community members on AB540 and tell them that they and their children can go to college and create a better future for themselves,” said Dae Joong Yoon, Executive Director of KRC. Groups that helped organize the community education forum include: ACLU of Southern California, Korean Resource Center (KRC), Legal Aid Foundation of Los Angeles (LAFLA), Los Amigos, National Korean American Service and Education Consortium (NAKASEC), OC Dream Team, OC Korean U.S. Citizens League and the United Healthcare Workers. The “Access to Equal Education” community forum was the first of a series of AB540 forums that the coalition is planning to organize in Orange County. The next one is scheduled for the fall of 2008.